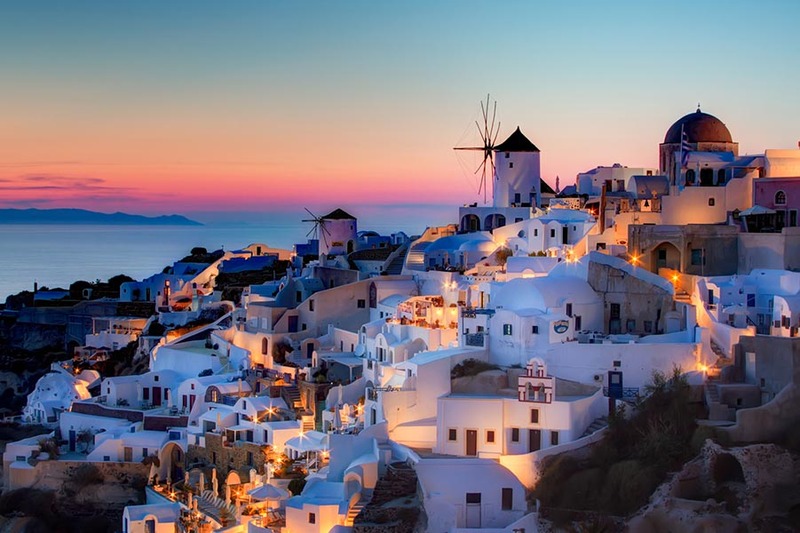 Santorini is one of the most fascinating island of Greece in the Aegean. The fame of the Santorini Caldera View is based on the 85 meter high cliff that many of the island's villages are built to perch on top of, offering a sea view as far as the eye can see. The name of the island unfold in your mind pleasurable connotations, volcanic landscape, grey and red beaches, dazzling white houses, terraces with panoramic sea views , stunning sunsets, wild fun. All this, together with remnants of lost civilizations discovered in the volcanic ash justify the epithets with which visitors identify Santorini and fairly is called, magical, indescribable, astonishing. The cliff is the wall of the submerged volcano crater caused by the cataclysmic eruption of this volcano around 3000 BC. In addition to creating the best views of the Aegean Sea for present day visitors to enjoy, this eruption also caused the demise of the Minoan civilization. Some scholars believe that the island is part of the legendary lost continent of Atlantis which supposedly slipped underwater during the disaster. Steeped in history, Santorini has plenty of archaeological sites to visit including the ruins of Ancient Thira, Akrotiri and the Venetian fortress at Pirgos. What remains today of Santorini is a large cresent-shaped island enclosing a vast bay, the largest caldera on earth (7X14 miles). There are also four much smaller islands called Thirassia, Nea Kameni, Palia Kameni and Aspronisi. We offer a variety of services and suggestions, to make your trip to Santorini unique. A visit to Kamari beach: Swim, walk with shops, cafes and restaurants along the way to enjoy. Also you can visit Ancient Thira ruins, in Kamari. A walk in Fira, the capital, with many shops and options. Restaurant or café in Fira with Caldera View is recommended. A private or semi-private sailing to the Volcano is a must thing to do. Or you may visit the Red beach. From there, you can go to the the white beach with a small boat. 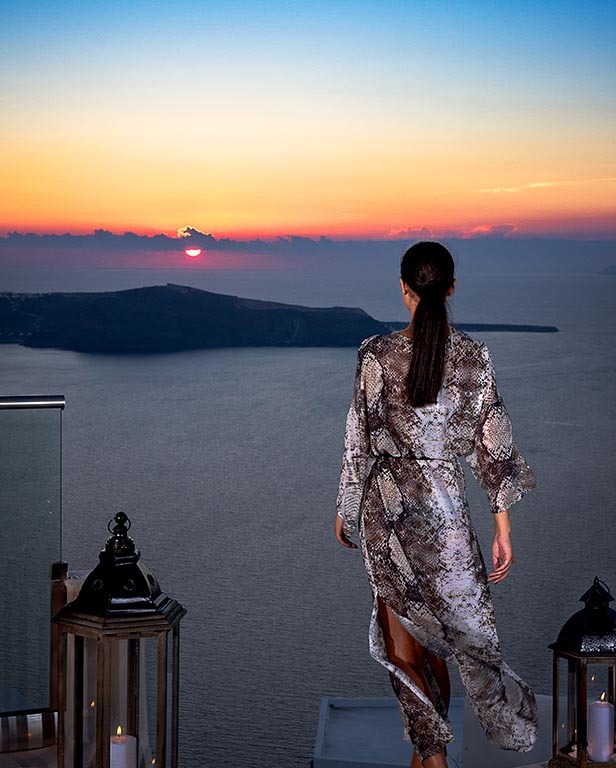 In the afternoon, the popular sunset in Oia is recommended. After you may taste fresh fish in Ammoudi bay, by the sea, close to Oia. You may visit the Museums in Fira. Also visit Perissa and Perivolos Bay. They are next to each other and have plenty of cafes, restaurants and beach bars. At the afternoon, enjoy the Galaxy Restaurant Specialties and the Views of the sunset from our terraces. 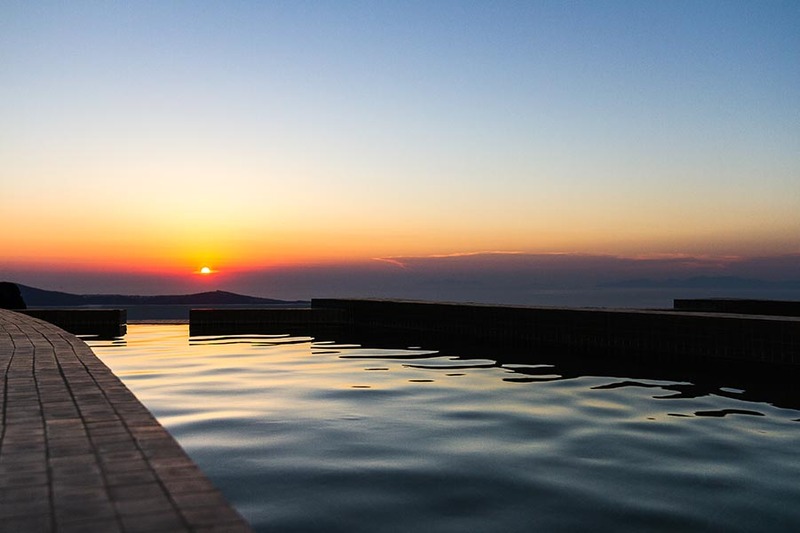 It is recommended to see the sunset 1 day from Imerovigli. Night Life: There are plenty of bars and clubs in Fira. Also Perissa has night bars.